after Julia’s last neuro appointment when her dr said she had signs of autism. I didn’t want that “word” in her records until Julia’s case was decided. Julia’s diagnosis was “Encephalitis (inflammation of her brain) most likely attributed to the MMR-V (measles, mumps, reubella, chicken pox) vaccine she had received nine days previously. The current UK rate of children with autistic conditions is 1 in 64. The rate in boys is 1 in 40. 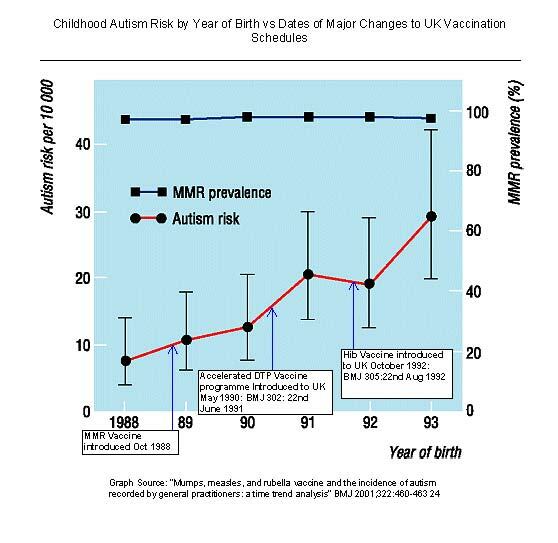 Prior to 1988 which saw the first of several major changes to the UK childhood vaccination programmes the rate of childhood autism was running at between 1 and 4 in 10,000. Childhood autism is also known as “typical” or “Kanner” autism. accepting the loss of the world as i knew it before she got sick, before my divorce, before i lost my house. If this is what compensation means for Julia’s Mom think of all the families and children who should never have got sick in the first place and will never get compensation just because they used the “autism” word. Does it help to think your child is “just a little bit” autistic but still injured and in need of financial help with medical care for life? Autism Spectrum Conditions are a spectrum from very mild to incapacitating. How many cases are like these ones? Who knows the exact number – the majority of decisions are never published – kept in secret. And then there are all the cases the US Secretary of Health and Human Services settles – also kept in secret. And how many cases are just not filed? No one publicly knows for sure. Before drug companies came up with the triple MMR vaccine rubella vaccine was of no benefit to a child especially boys and especially compared to the risks. Mumps vaccine was expressly not recommended for children. So why are we giving them? It is time all parents started asking the simple questions – like that one. It is unethical to give a child unnecessary medical treatment and can be a criminal offence: Appleton v Garrett (1995) 34 BMLR 23. Today it is your kid. Tomorrow it is you. Julia was born a healthy baby on 12-28-05. She was a delight to her family and friends. On January 5th, 2007, one week after her 1st birthday, our family’s lives changed forever. Julia (unknowingly to her family) had been seizing in her crib most of the night, was transported to the nearest ER for stabilization, and then airlifted to Miami Children’s hospital, where she stayed in PICU and the neurology ward for close to one month. Her diagnosis? Encephalitis (inflammation of her brain) most likely attributed to the MMR-V (measles, mumps, reubella, chicken pox) vaccine she had received nine days previously. When Julia left the hospital, she was functioning at a two month level. She was (and in some respects still is) globally delayed and with significant left sided hemiplegia. It has been over two years since her MMR-V induced encephalitis, and Julia has come a long way, but has a very long way to go. Julia lives with her brother, Jack who is six and so understanding of her. She also lives with her mom, Susan. Her father recently moved out of state following her parent’s divorce. Julia and her family are hanging in there and hope you enjoy her blog! Go Julia! AMAZING DAY! A MIRACLE HAS HAPPENED! JULIA WON HER LAWSUIT WITH THE VACCINE INJURY COMPENSATION PROGRAM! THE GOVERNMENT CONCEDED! This means that they agreed that the MMR vaccine caused her encephalitis and resultant brain damage (I mean Marvelous Mind – right Howard!!). This is such a huge, huge, huge help for Julia and my family. The government will reimburse all of her past medical expenses (to her, not to us, which I find a little odd, but OK!) and will pay for all future medical expenses that she incurs from her vaccine injury. I will update as I find out more. Her attorney (Ron Homer and/or Kevin Conway) will be flying out here this summer to evaluate her and her needs with a “life planner” to try to determine what her needs will be. This is HUGE! HUGE! The VICP rarely concedes…..almost never……but they did for her! AMAZING! Another funny thing to go along with this…..I had just the day before changed my ringtone on my phone to “Its the end of the world as we know it….and I feel fine” trying to find a positive ringtone – accepting the loss of the world as i knew it before she got sick, before my divorce, before i lost my house, and moving forward – and being fine with it….AND NOW – ITS THE END OF THE WORLD AS I KNOW IT – AND I REALLY FEEL FINE! SHE has HELP!!!!! Our struggle is going to be lessened!!!! I am Julia’s mom, and this story has been a bit misconstrued. Julia did NOT have a formal diagnosis of Autism. I was told she had some characteristics of Autism, one time, at her last neuro appointment, but she was not given that diagnosis. I just wanted to clear this up, mainly to not give false hope to others with the Autism diagnosis. Also, her compensation has yet to be determined. I simply learned the government conceded her case, but we have yet to arrive at a settlement and don’t want anything to interfere with this process. I am sure you all understand. [ED Thanks. Noted. Have no fear. You will not be giving false hope from Julia’s case. Robert Kennedy and David Kirby’s Huffington Post article we have quoted explains that cases other than Julia’s where autism is caused by vaccines are being won by claiming for injuries without referring to “autism”. Encephalopathies have also been linked to autistic spectrum conditions by the research we have linked to in the article [and not simply by reference to Julia’s case]. You wanted to help others and you have done and are doing so. 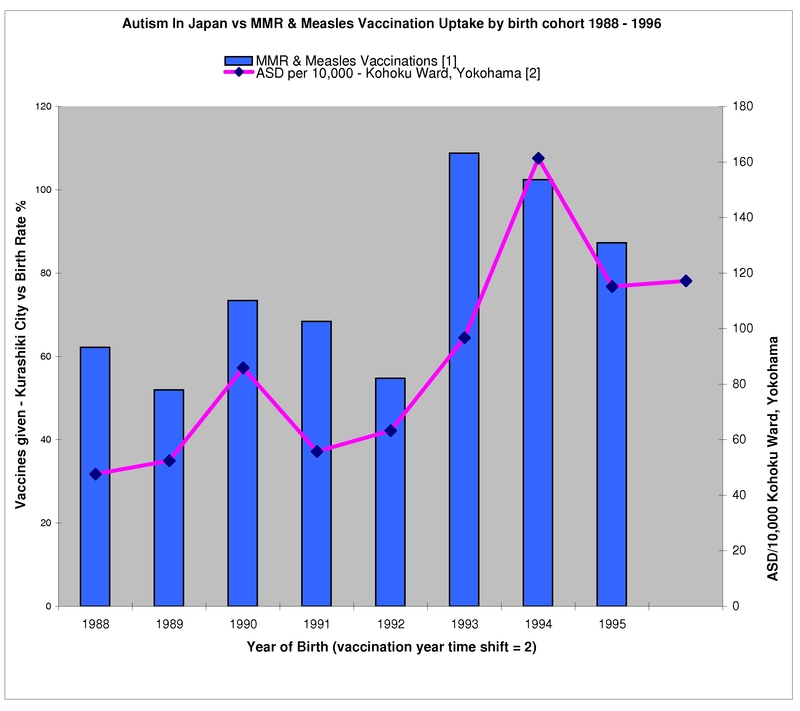 If you take a look at our article Japanese Data Show Vaccines Cause Autism you will see that the data shows with little room for doubt vaccines have been causing autistic spectrum conditions in Japan. It is not all reliant on Julia’s case – very far from it and you need not worry that it is or that anyone is being misled by her case. You have a delightful little girl and we wish you both well.]. There is an article about the Amish, autism and vaccinations on http://www.wholehealthweb.com that says (among other things) that the research that states autism is not caused by vaccines does not amount to much. It also says that a study to compare health (and autism incidence) in vaccinated vs unvaccinated populations has not been done. Anyone know about this? Can you get the MMR shot broken up and administered in its separate forms? Meaning, can I bring my baby in for just a measles shot, then a week later get his mumps shot, then a week later get his rubella shot? And for that matter, any of the 3 or more in one shots, cant they be administered separately? And if they can, what is the recommended safe span of time between shots? A week, a month? Please respond. Congratulations and best wishes to Julia and Julia’s mom and brother! What a little sweetheart! From one single mom to another: “If the Father’s eye is on the sparrow, then surely he will care for you.” –Jesus in the Bible of course. And thanks to Child Health Safety for this great article. What nobody realizes is that many abusive or “in-denial” spouses will not allow a child to be diagnosed in the first place. Therefore we need to study custody battles in family courts and link it to Autism, rather than study Autism and un-link it to divorce. the myth that is the MMR autism correlation should forever rest in peace. There was no science to this supposed study. It’s primary authors are nothing more than criminals trying to benefit from the misery of desperate parents. Sad. 3) papers published independently in mainstream leading medical journals confirm, just as Dr Wakefield found in 1998, that autistic children suffer serious bowel disease when their non autistic contemporaries do not. In an article and editorial published online, a leading medical journal, BMJ, has taken aim at a competitor, The Lancet, by singling out a controversial paper that falsely linked a vaccine to increased risk of autism. The object of BMJ’s scorn is a 1998 paper by Andrew Wakefield, MBBS, and colleagues that implied a link between the measles-mumps-rubella vaccine and autism. Wakefield, according to the BMJ, was guilty of fraud. “The Wakefield fraud had sat in plain view for six years before serious challenge. Journals, the BMJ included, had fretted over epidemiology and viral studies without giving pause to the remarkable, now fully-retracted, fundamentals,” wrote journalist Brian Deer in a blog posted alongside the editorial and full report on the BMJ website. The BMJ report is the latest installment from Deer, who had previously uncovered discrepancies between the published report and records of the 12 children described in the 1998 paper, published in The Lancet. For the new article, Deer obtained more of the original records — many of which were made public last year in a U.K. General Medical Council proceeding that stripped Wakefield of his British medical license — and interviewed the children’s parents. Deer reported that many of the Lancet paper’s descriptions of the children’s conditions before and after vaccination were at enormous variance from the children’s medical records — so much so, according to Deer, that Wakefield must have committed research fraud. For example, the Lancet paper indicated that 11 of the 12 children had “nonspecific colitis,” but Deer’s investigation found that only three had such symptoms. More damningly, Wakefield and colleagues said eight of the children began showing autism-like or gastrointestinal symptoms within days of vaccination, whereas the records indicated that was true of no more than two. For the others, symptoms either had already been recorded prior to vaccination, or were not noted until months had elapsed, Deer indicated. The Lancet formally retracted the 1998 paper last year, nearly a year after Deer published a series of articles in the Times of London that accused Wakefield of falsifying data, though it stopped short of calling the paper fraudulent. In an editorial accompanying Deer’s latest investigation, BMJ editor Fiona Godlee, MB, BChir, BSc, was not so diplomatic. Godlee blasted Wakefield for “alter[ing] numerous facts about the patients’ medical histories in order to support his claim to have identified a new syndrome” and insisted that incompetence could not account for the discrepancies. “A great deal of thought and effort must have gone into drafting the paper to achieve the results he wanted: the discrepancies all led in one direction; misreporting was gross,” Godlee wrote. She also had harsh words for Wakefield’s co-authors, even though most had previously repudiated the paper and the General Medical Council found that Wakefield alone had written the paper submitted to The Lancet. Godlee said nothing about the responsibility of journals, including BMJ, that regularly published articles by Wakefield and colleagues in addition to the notorious 1998 Lancet paper. But in a sidebar “blog” article also appearing on the BMJ website, Deer noted that they too deserve blame. “Did the scientific community ever really believe that 12 families had turned up consecutively at one hospital, with no reputation for developmental disorders, and make the same highly specific allegations — with a time-link of just days — and that there was not something fishy going on?” Deer asked. He likened the episode to the Britain’s Piltdown Man fraud, in which a phony skeleton constructed of modern human and ape bones was officially accepted for decades as an ancient “missing link” until the deception was revealed in 1953. Steve Lauer, MD, of the University of Kansas in Kansas City, had more blame to lay at Wakefield’s feet: the ongoing pertussis epidemic in California. [ED: Funny that. If the paper was a fraud, its findings could not now be confirmed in mainstream medical journals and by US government officials, but that is what has been happening. 1) They haven’t. They only confirmed a regression factor is vaccines. Autism is genetic. 3) Wakefield was found to be a fraud by the GMC and was struck off in Britain for practising medicine..
And before you point me to the comment by Collins, there is an explanation in the shift. The DSM-IV. It changed diagnostics completely in 1994 by adding the work of Hans Aspergers, leading to a massive upswing in DX’s. Aspies were always there, but they were hidden in a society that used to be generally routine and autonomous within school and the work place. But not anymore, and this also contributes to regressions through sensory overloads. Vaccines could only cause an overload (and consequently a regression) if it was administered incorrectly in some way. In the United States, the Vaccine Court protects doctors and anyone else who mucks it up and takes the blame – as it did for instance with Hannah Poling, who got nine vaccines in the one visit (STUPID!!). I’m willing to bet there was an issue with the administration of Julia’s jab as well. You seek a simple explanation. There isn’t one. This entire article is full of holes that have many alternative explanations and as a consequence destroy the idea that vaccines cause Autism. They don’t and to say otherwise is to slander the condition and prevent proper supports, treatments and early interventions for those with the condition who have suffered regressions from a multitude of sources. [ED: We know what to make of the excitable comments from this person. “Autism is genetic.” As all disease is genetic that is tautologous and a pointless remark. What this person intends to say is that the causes of autistic conditions are internal and not external. That is medically, factually and logically impossible. The Aspergers gambit is also a blind alley. The highly reliable clinical data from Israel based on modern diagnostic criteria of clinical examinations in 2005 shows that there were hardly any cases of Aspergers in young adults born in Israel prior 1986 – that is prior to the introduction of the MMR vaccine and the expansion of the vaccination programmes in Israel. So the increase in Aspergers has in fact been huge and the increase in childhood autism has been substantial too. Why is the article written in 2009, but the article is about diagnosis made in 2010. How could that be? Time warp? I can’t believe so many people still support vaccines, even though there is so much evidence that they are harmful! It just goes to show the state of our society right now, there are deep underlying problems that need to be fixed.